Experimental Archaeology is a method to study ancient behavior and technologies by recreating those technologies, today. 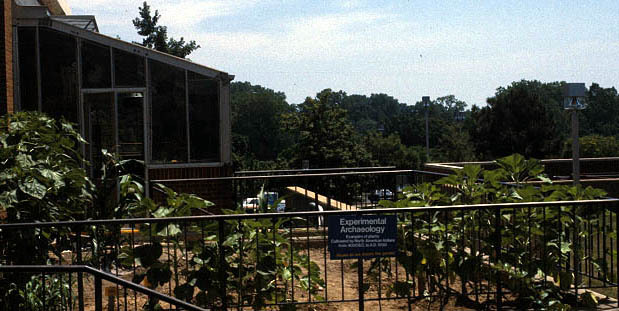 St. Louis Community College - Florissant Valley conducted over 10 years of experimental gardening on the college campus to answer a question: What did the crops look like that were grown in the St. Louis area during the Mississippi Period (ca. AD 1200). For example, was the Native American corn extremely tall (like most modern commercial varieties), average, or short in height? 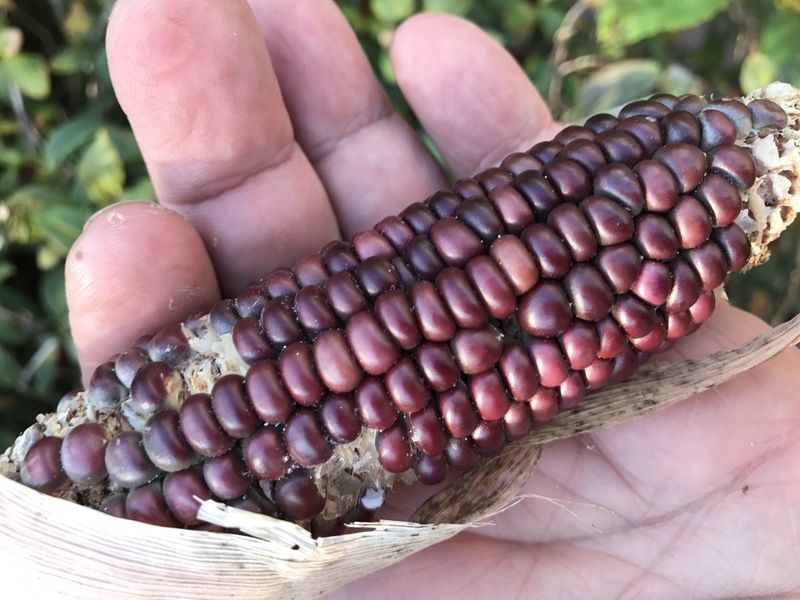 Professor Michael Fuller contacted the research biologists at USDA and received samples of Osage Red Corn that is believed to be a variety of corn that was once cultivated by the Osage Nation for ceremonial purposes. 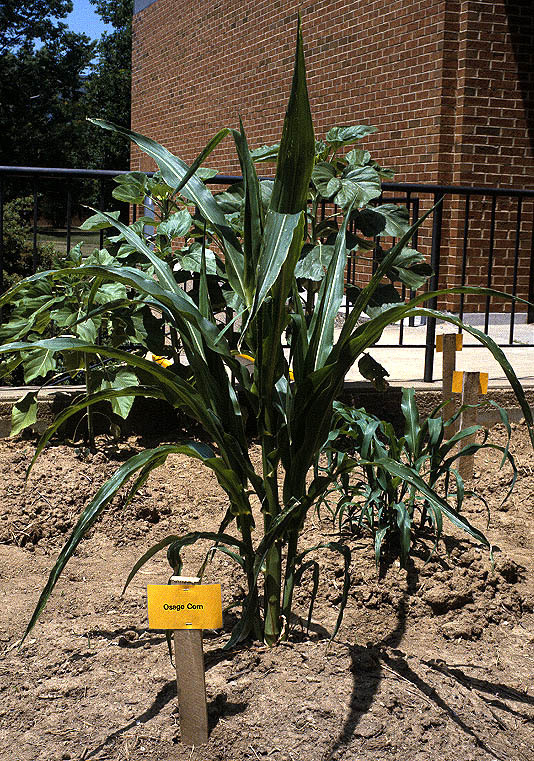 The red corn was planted in the garden as well as Hopi Sunflower, Hopi Cotton, a southwestern form of pumpkin, bottle gourd, a native American variety of beans, and Amaranth. The varieties of squash, gourd, sunflower and Amarant were obtained from Native Seed Search, INC.
Osage Red Corn typically grows about chest high and produces a single medium size ear per plant. It seems to be very hardy. Osage Red Corn grown at St. Louis Community College - Florissant Valley during the 1990s. This ear measures 12.4 cm in length, 3.2 cm in diameter. It is a 14 row ear with 2 kernals per row. 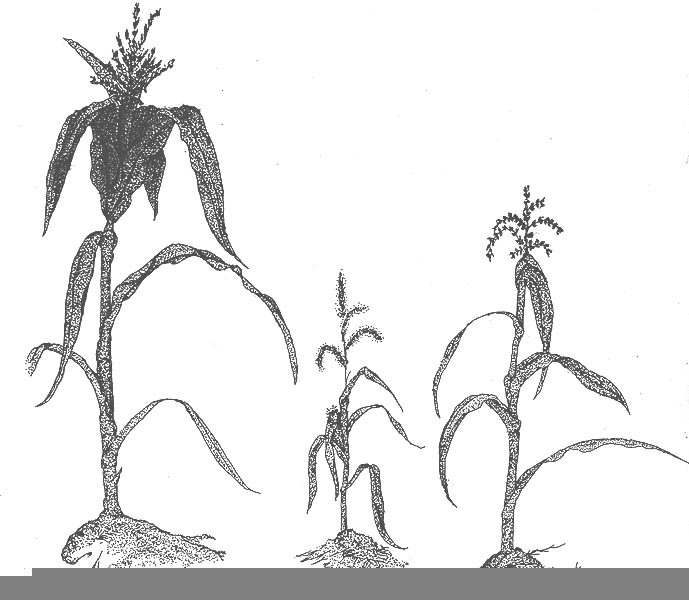 Ink drawing showing comparatively size and leaf pattern of Osage Red Corn (right), Seneca Hominy Corn (center) San Xavier Corn (left). 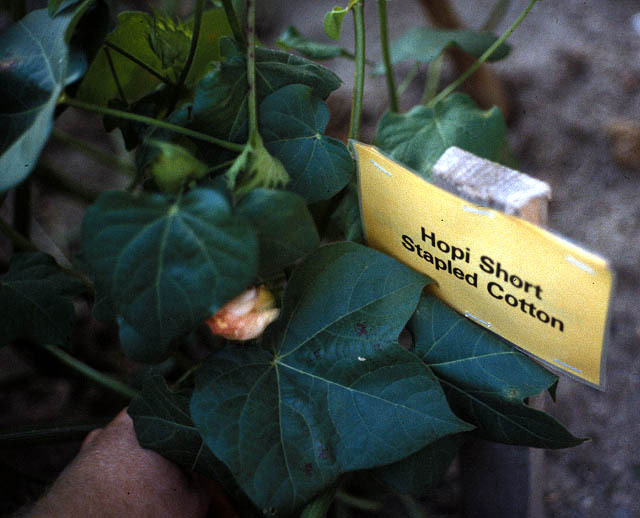 Hopi Short Stapled Cotton (seeds obtained from Native Seed Search) always proved viable in terms of germination and survival during the summer. It would also bloom (as in this photograph) but never live long enough to mature and produce a large cotton ball. If the growing season was just slightly longer in St. Louis, this variety of plant would be economically practical. As it is, our cotton crop always failed. 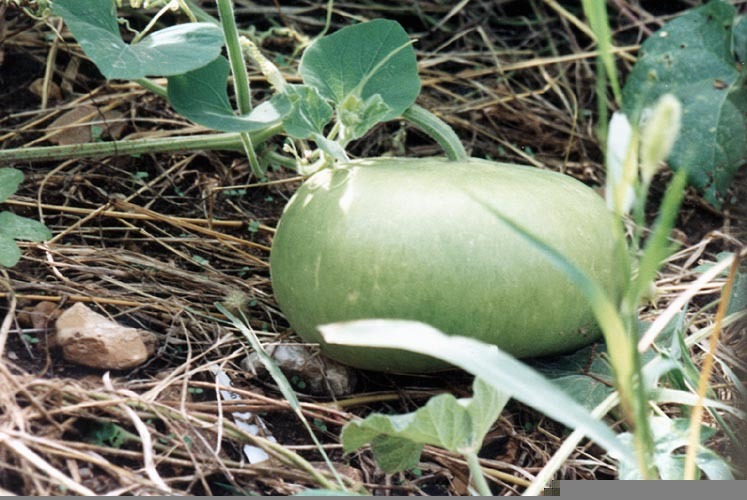 The SLCC experimental garden always had a good crop of bottle gours and rattle gourds. 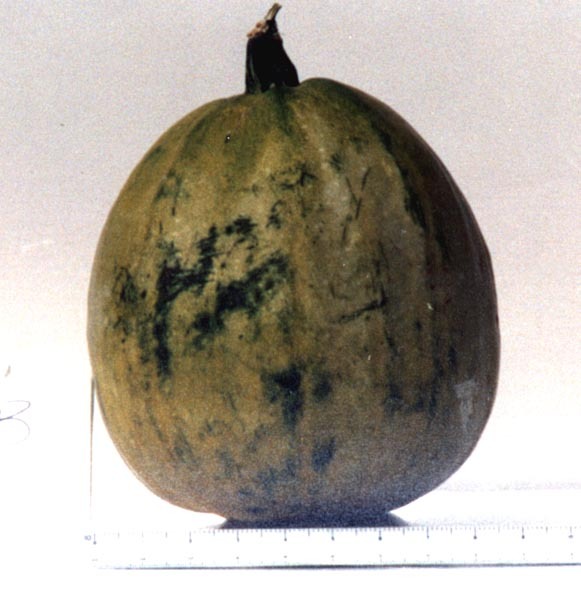 This Acomoa Rattle Gourd (Lagenaria siveraria) was grown during the summer of 1992 and studied by Bonnie Potter (a SLCC-FV anthropology student). This gourd weighed 160 grams with a height of 6.5 cm. the circumference was 33 cm. This gourd made a wonder shallow bowl (much like pottery examples). 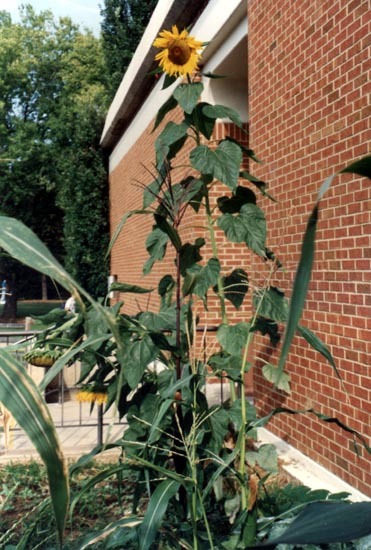 The SLCC experimental garden always had a good crop of sunflowers. 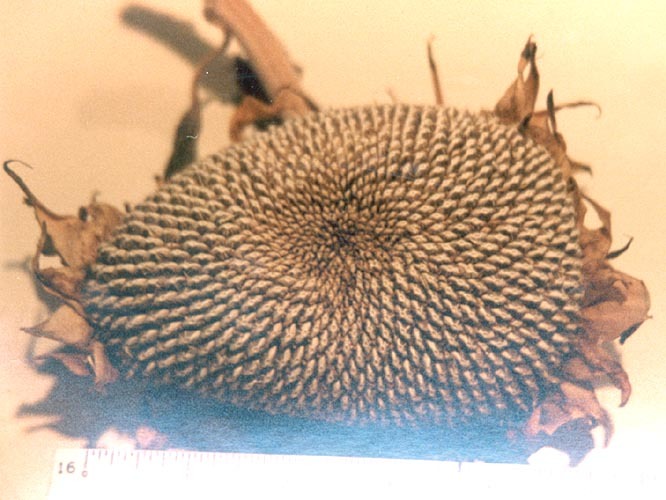 This Apache Brown Striped Sunflower (Helianthus annuus) was grown during the summer of 1992 and studied by Bonnie Potter (a SLCC-FV anthropology student). This sunflower grew 1.75 meters tall and had a single head that measured 7 cm. in diameter. The dried head weighted 100 grams. The SLCC experimental garden always produced a great crop of squash. Sometimes the plants "took over" the garden and grew out on the sidewalk where they were attacked the college groundskeepers using pruning snips. 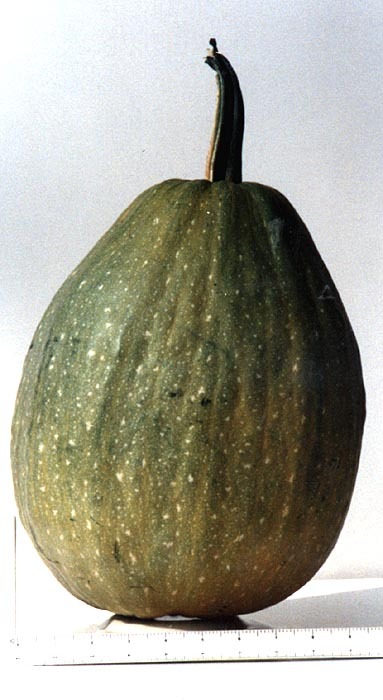 This Acoma Pumpkin Squash (Cucurbita pepo) weighed 4 kilograms and was 32 cm. in height. The circumference was 81 cm.! Gardeners recommend a 5 cm. stem be retained to preserve the squash during the winter. This specimen has an 8 cm. stem. The speckled and lightly ridged flesh of the fruit is very common. This Acoma Pumpkin Squash (Cucurbita pepo) was much smaller and more typical. It weighed 2.5 kilograms and was 28 cm. in height. The circumference was 72 cm.